Jess Keeling, aged 17 years old, from Blaby, diagnosed with Long QT syndrome, often a pre-cursor to SADS, in 2008. 'I was 12 when I felt chest pain whilst walking. As a precautionary measure we went to the doctors and they were doing a scheme that meant that if any child came in with chest pain, they'd do an ECB and check for undiagnosed heart conditions. It came back abnormal and I had tests at Glenfield Hospital. The results were again abnormal and I was put on beta-blockers with further tests revealing that I had congenital defect. The initial chest pain I'd experienced wasn't actually related, it was muscular, so I had no real symptoms. I was just lucky that the GP surgery were carrying out those tests'. 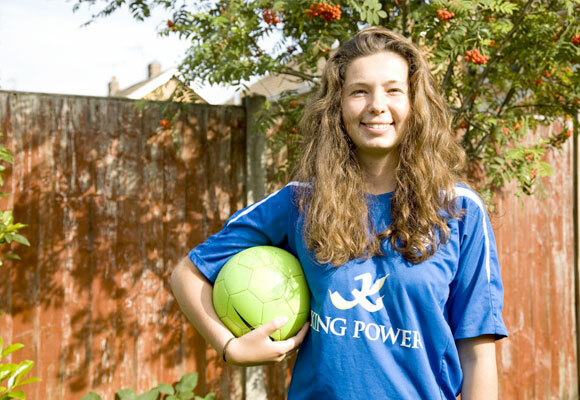 Jess was told that she could no longer play competitive sport, at a time when she had been identified by the Football Association as of international potential. A keen footballer, she was determined to continue playing sport and living her life to the full, as she explains, 'I'd go crazy if I couldn't play football. I play four times a week for Leicester City Women, the county and the school. The FA let me play despite my condition and the physio's have a list of the medications that I am not allowed to take. 'It doesn't really affect my day to day life. I'm not supposed to do things that get the adrenaline going, like visiting Alton Towers, but I do. You have to live your life and taking medication reduces the chance of anything happening by 95%'. Following Joe's death, the Humphries family invited Jess to become the Trust's Young Persons' Ambassador; a role that she feels very passionate about. 'I've talked at launch events and played in the JHMT Legends Charity Football Match'. 'The main thing is to raise awareness. If young people had compulsory checks at a certain age there would be far less casualties, and if every young person learnt CPR they would become a potential lifesaver but having defibrillators at schools and sport clubs would also be handy in emergency'.